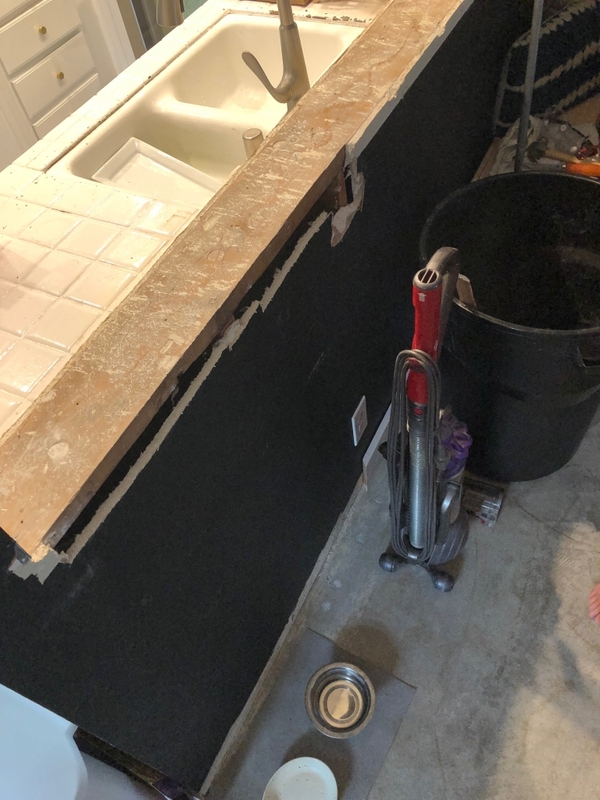 Alright, now that you’ve seen the inspiration and our plan, let’s jump right in to the beginning steps of this kitchen refresh. Once we had determined we were going with butcher block counter tops, I started doing my research. So many tutorials on Pinterest used the Ikea counters, so that was our plan too. 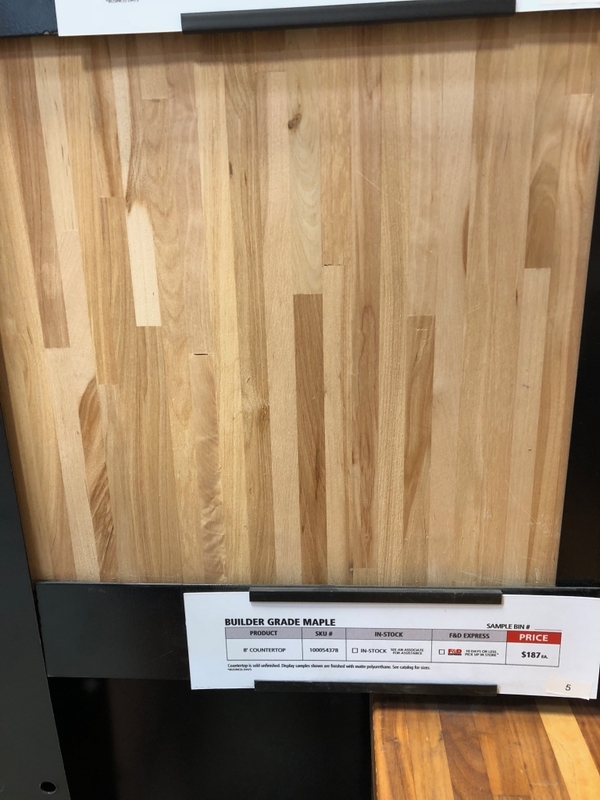 We took a trip to our local Ikea and quickly found out they had stopped carrying the solid wood butcher block and since had opted for the veneer kind. Yah, no thanks. If I was going to do butcher block I wanted REAL butcher block. The kind that year after year I can sand and refinish so that it looks new. The kind that gradually gains character from the dents and scratches, I wanted the authenticity of real wood. Soooo our search continued. We ended up taking a visit to Floor and Decor and immediately found what we wanted, we chose the Builder Grade Maple. I loved the variation in the wood, but that it still had a fairly clean visual to it. We ended up purchasing 3-8′ pieces for our kitchen refresh. While we looked around Floor and Decor we also found a tile that I loved. 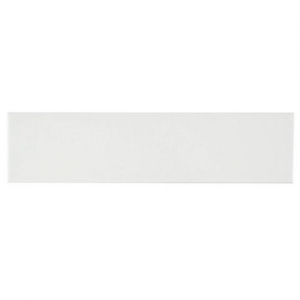 I already knew we were going with the 3×12″ white subway tile for the backsplash, but Floor and Decor had the Meringue Matte ceramic tile and I fell in love with the finish. Once we had the counter tops in our possession we had to get them prepped and ready for install. This is an incredibly important part of butcher block. You’ll get really used to the steps of sand, seal, dry, repeat. 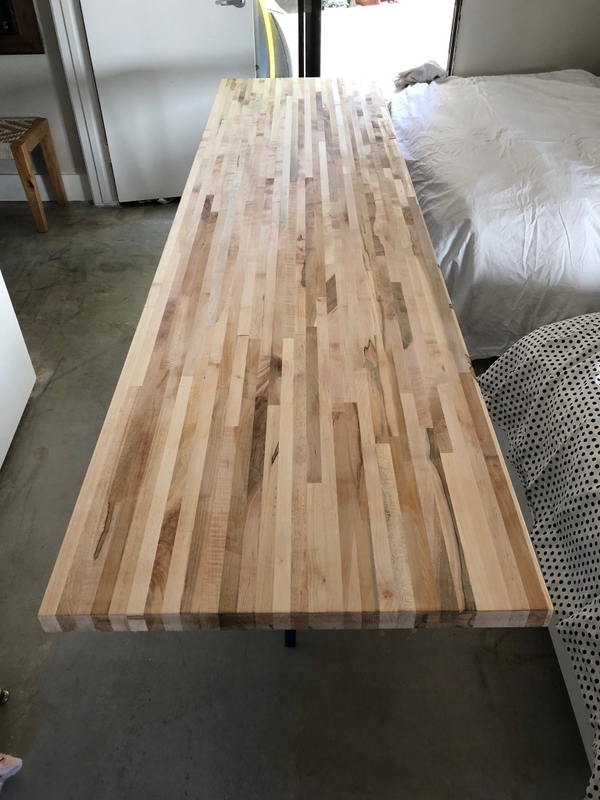 The more coats of butcher block oil you can get on them the more likely they will withstand coming in contact with the elements. 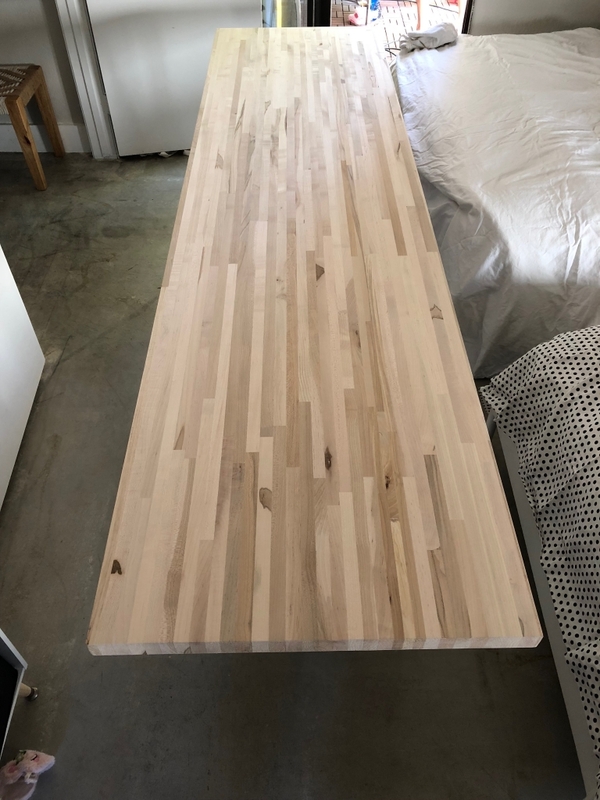 The first step is to sand the butcher block, we used 80, 150 then 200 grit sandpaper (in order of coat) and then did a light, thin coat of the oil in between each sanding. 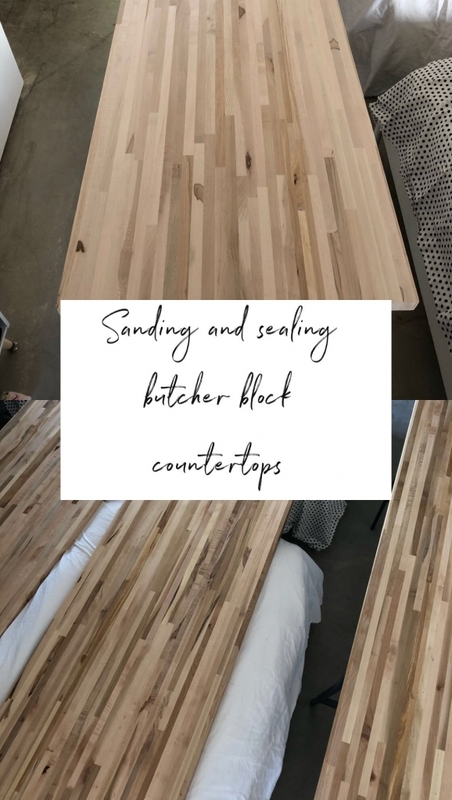 We used Rust-oleums Watco butcher block oil (affiliate link) because it is completely food safe and had great reviews. Be sure to purchase latex gloves because you don’t want the oil to come in contact with your skin. I also used a white flour sack towel I had on hand to apply the oil. Then we let the butcher block dry for at least 6 hours before we did the next coat. The best plan is to start in the morning, so you can get the second coat on in the afternoon and then do it again the next day. We did 4 coats total. Here is the butcher block sanded and getting ready for seal. And below is the butcher block with the first coat of sealer. You can see how the warm tones really come out once the oil is on it. Once it’s dry and you sand again, you’ll notice the warmth isn’t fully there, don’t fret, it comes right back with the next coat of oil. While each coat was drying my husband started the demo on the old counters and backsplash. This was a super fun moment, followed soon after by a bit of panic. Haha, no turning back now! One of the most exciting steps for me was that we were lowering the bar top. I truly don’t get why this design was all the rage in the 80’s and 90’s, but I couldn’t stand that my counter was chopped in half. So the demo starting on this part made me giddy. Demo took a few days because nothing is ever as easy as you’d think it would be. 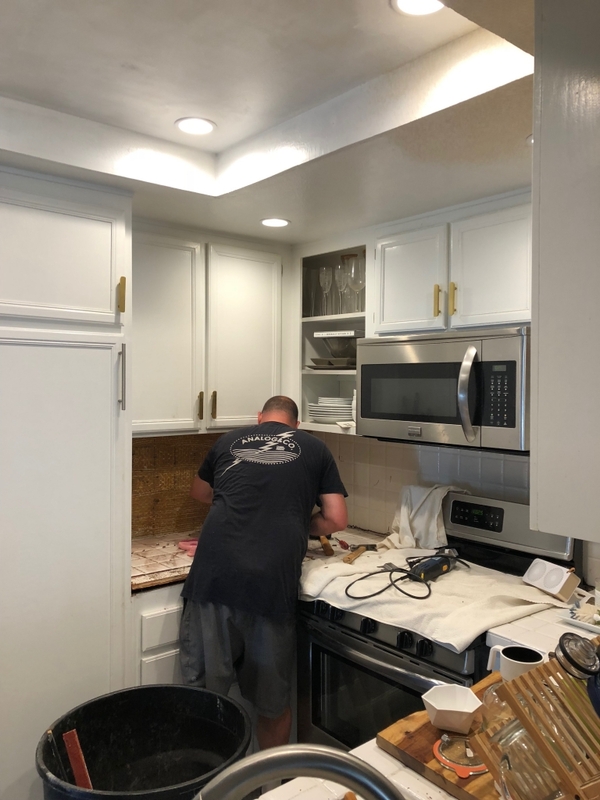 Our old counter tops were so nailed into the cabinets below it took lots and lots of careful prying to not damage the cabinets. My husband is a rockstar for doing the demo all on his own. So that is what we’ll call week one of this project….a day of shopping and then a few days of sanding, sealing and demo.